In the world of digital marketing, staying ahead of the game is one of the most important elements. No one man can do it all by himself, that’s why digital marketing tools were created to help. In this post, the Social Fusion Group looks into one of our favorite tools, SEMrush. 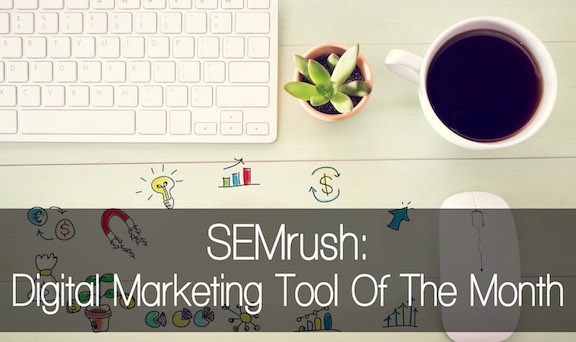 If you’re a marketer, SEMrush is in your arsenal of online marketing tools. To start off, this platform helps with SEO, keyword research, check for backlinks, and do a complete SEO audit (just to name a few). Let’s dig into some of our personal favorite features. When it comes to blogging and your website, keywords help drive organic traffic to the given post. Without a tool, you would never know if you can compete on certain phrases, either short tail or long tail. It’s also common to get stumped when brainstorming phrases. But fear not, SEMrush has a feature to help! For this example, lets take a look at the keyword “social media”. It literally is magic! When “social media” is typed in the keyword tool, we get a whole list of phrases and its description. The image is broken down to three tiers. As you can see, SEMrush provides additional topics regarding the social media. Maybe you haven’t found a specific topic but if you look at the box, "social media management" has 723 unique keywords, or "social media post" has 474 keywords. In total, SEMrush found 28,815 keywords on just the topic of social media! Although the second arrow is pointed specifically to “Volume,” for our example we’re referring to the complete toolbar. SEMrush allows you to refine your search further by including or excluding certain words, total search volume, average cost per click, and difficulty of the keyword. Finally, SEMrush breaks down your search results in an easy to navigate table. As the search result shows, the average difficulty for “social media” is only 30.65%! 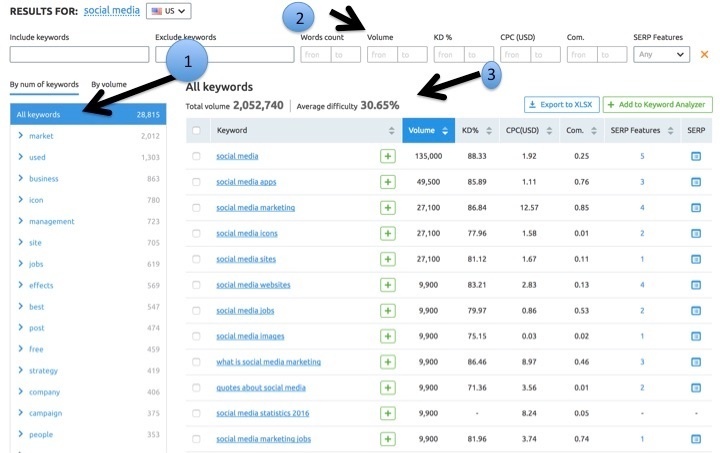 It’s important to note that if you want to find a keyword difficulty for a specific phrase, SEMrush has a simple tool to easily enter the given keyword. Now that you have the keyword, how do you write a winnable blog post? With the SEO content template, SEMrush gives you semantically related words, websites to get backlinks from, average readability, and how many words your content should be, as compared to the top 10 ranking competitors. Furthermore, we can even download the total list of keywords! Here's an example of how it looks like. 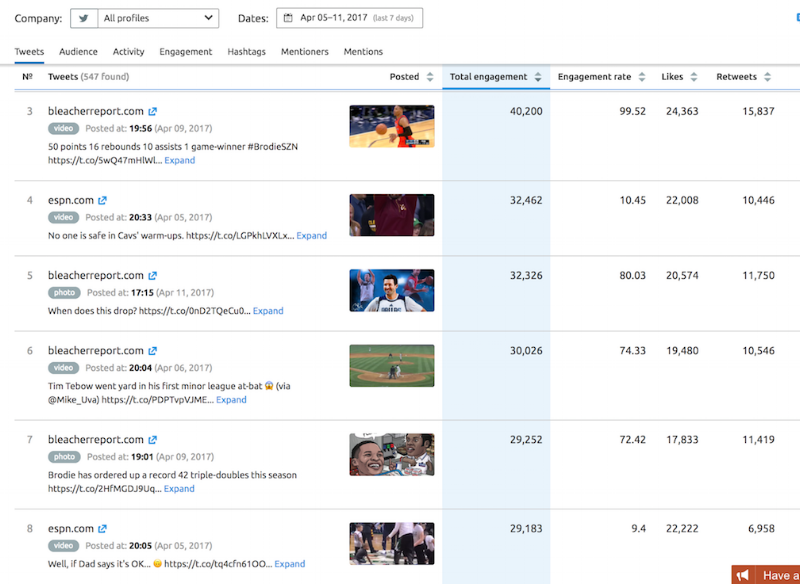 In the image below, SEMrush provides analytics for ESPN's website. In fact, SEMrush is such a powerful tool that you can input an individual URL and generate insight from it such as ranked keywords! SEMrush also offers this very cool tool that helps you improve the SEO for your existing pages. 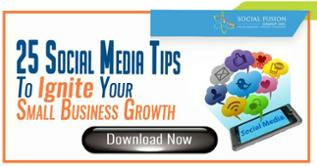 It offers tips on: semantics, strategy, content ideas, and backlink ideas. 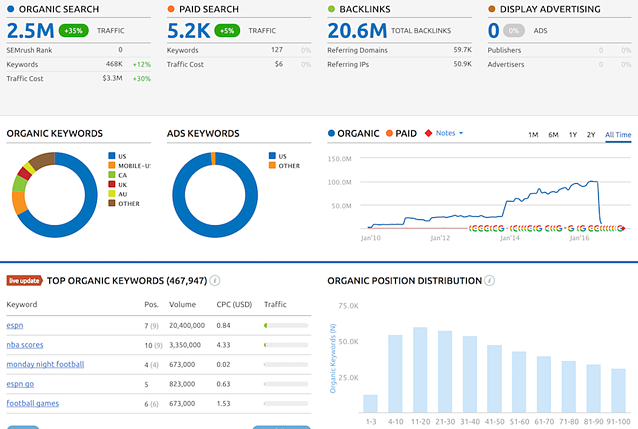 If you’re a marketer or business that’s looking to take their campaigns to the next level, SEMrush is a must use tool. From social media analytics to SEO tools, you won’t be disappointed in what they have to offer. In the coming weeks, be sure to look out for our next featured digital marketing tool. Be sure to follow us on Twitter and like us on Facebook to stay update on all our content!